This is one of the better re-dials Ive come across. While there are still tell-tale signs that indicate it is refinished, it's a very good effort. While it doesn't pass the MOY test, the refinisher has done an excellent job of replicating the serif lettering. Click on the pic for a closeup of the dial. Ive always believed that re-dialling a vintage watch is only an option when one has no option, but of course the older they get, and the fact that many manufacturers have run out of dials for vintage watches, means that it will, ultimately, be the only option for corroded or damaged dials. There are numerous dial re-finishing houses around the world, but judging from the redials Ive seen there are some absolute shockers. Many problems can arise from redialling, such as badly painted minute markers; smudgy and poorly reproduced script; substandard coatings and paint edges; inappropriate and non-authentic colours and finishes and uneven symmetry of the lettering, to name a few. Ive been searching around for examples of good rediallers and they are few and far between. A bad re-dial with inaccurate detailing can have the value of your watch dropping quicker than a souffle put in a refridgerator! It's fair to say that there are many more slap-dash, incompetent and inferior refinishing houses than there are high quality re-dialers. So, if you chance upon one, treat him like royalty....and let me know so I can share with others! When you are in contact with a dial refinishing house do your homework and establish the quality of the work before you commit. Have the dial removed or remove it yourself if you have the skill. Take large close-ups of the dial, case and movement - this will become clear below. Make sure you identify your watch amongst the scans you send to a re-dialler as an estimate will only be as accurate as the information you provide. Give instructions in respect to the logo and markers - if you want them repolished make sure you state that repolishing or replating (if they're not solid metal) is required. Ask the re-dialler to check the dial posts and if damaged to repair them before the re-dial, and if there any dents or damage to the dial to do that work prior to refinishing (In one case I know a refinisher simply left dial dents alone and refinished over the top). If the dial is corroded beyond recognition, you may have difficulty with some refinishing houses as they may be reluctant to provide you with a dial that indicates the watch is an officially certified Constellation chronometer if you cannot prove it is. This is where the pics of the movement and case, brochures, and pics of reference Constellations may come in handy. You may have to provide a comparative anaysis of your watch against the specifications of a Constellation. For example, pointing to the rotor bridge and train bridge of the movement showing the correct stamping, and comparing the case style and backcase case numbers that show your watch is authentic. If a re-dialler still wont play ball - choose another who will. Ask for a quotation before giving authority to proceed and when you receive your dial back, examine it closely with a loupe to ensure that it resembles as accurately as possible a genuine Constellation dial. Compare it against reference pictures of authentic dials. You'll never get an 100 percent exact replication of an authentic dial, so the issue here is to get as close as possible - the closer the better and this is the essential difference between a professional re-finishing house and a bodgy operation. I hope some good folks are able to share their Omega rediallers. I know of a few companies here (International Dial and Eagle Dial) that specialize in American brands such as Hamilton, but none that do a top-notch job on Omega. Agreed, I want to get a list of refinishing houses that do a great job on Omega. Ive found few really. Love to hear from subscribers on their experiences. I know Constellations are your favorites, but have you ever done articles on the Speedmaster or the Moonwatches? Thanks for your comments. Here's hoping a Connie with your name on it does indeed comes up. The absolute guru in Speedies was the late Chuck Maddox, and hence anything that I wrote would in no way match the quality and depth of Chuck's knowledge. 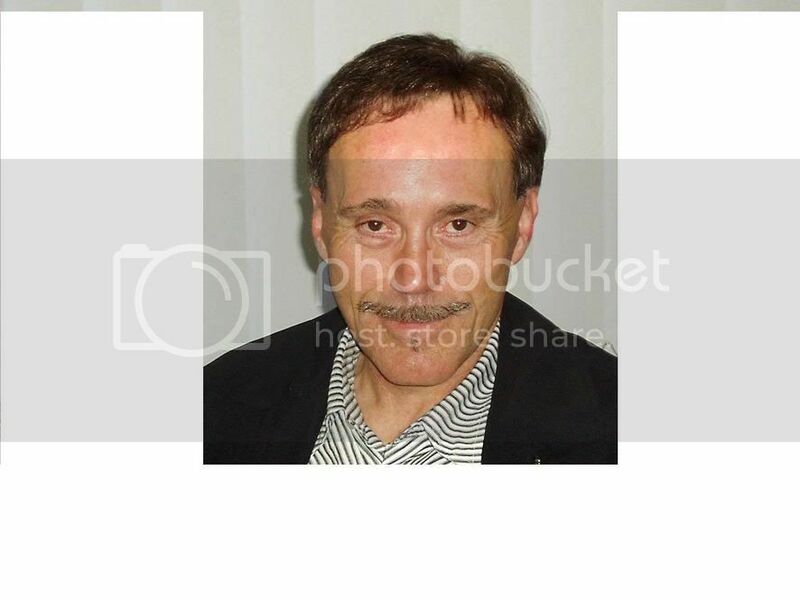 Fortunately the guys at Chronocentric has preserved Chuck's legacy and there are numerous quality and authoratative articles at the site below. I had no choice but to redial my watch. I inherited a Constellation from my Father. He bought it in Germany in 1957. I learned from researching your site that at some point in the watches life, my Father had had the watch redialed himself, and very poorly done I might add. I was very dissapointed, and my father was no longer alive to ask what he had actually had done to the watch. So I had no option but to have the watch redialed. The watch looks 100% better but still fails the MOR test as your example does. I love your site. I have learned much about my watch. thanks for your support of the site. Yes I agree there are sometimes that refinishing is the only option. Thanks for this excellent article Desmond! I enjoy contributions for some month and hope to become more familiar with Connies and will be able to purchase a nice example some day. I'm not a native English speaker, so what exactly is meant when you wrote "..there are still tell-tale signs that indicate it is refinished"? Beside the MOY-test, are there more indications of the refinishment in the example? The 12 minute marker is too bold and doesnt match the others. The 19 minute marker is not fully printed. The printed markers at 4 'oclock and five o'clock particularly are not in the centre of the applied hour markers. The As in calendar should be boxed As as they are in 'Automatic'. The D is not fully printed in calendar. PS Good luck in the search for a nice Connie! Wow! I'm amazed how many errors you spotted in that dial Desmond! Like the others here I'm addicted to your site. One day I'll find the perfect one and I'll finally join the Connie club! Yes, and I forgot to mention that the star is slightly off-centre and should point to 12 o'clock exactly and the script is a bit too high from the star. But the redial is an excellent effort never-the-less. One of the early Connies I bought (quite a few years ago) was franken-ish :) I also bought a redialled Connie in Italy, thinking it was genuine - too much confidence and no loupe on me at the time. I guess it was one of the reasons why I decided to bone up and publish what I'd researched - hopefully the site has helped a few Connie aficionados avoid the major pitfalls. Excellent article Desmond, also thanks for the tips in the comment sections. Wouldn't somebody rather go to or send their watch to an Omega dealer instead of hoping that somebody will do a good job? Generally, with vintage watches, I recommend that the owner become, say, the equivalent of an 'owner-builder' and, as with canny owner builders, one often can get a top job at a better price by shopping around on both price and quality. 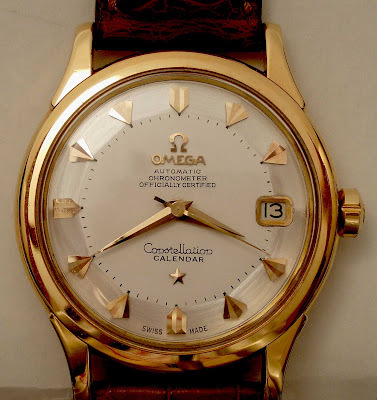 In my long experience of collecting Connies, the best option that Ive found is to locate an 'older' watchmaker who has worked on Omega over the years (and who may well have a heap of old parts watches around) and have him do movement and case restoration under my instructions. I can then source the best refinishing house, no matter where in the world, for refinishing of a specific dial. That, in my opinion, gives me the best chance of achieving an overall better job than sending to Bienne. Thank you for the informative response. Please let me know if you can recommend anybody that can restore in the Los Angeles area. They are said to be both one of the best and perhaps one of the more expensive. Another comment that ive received is that they kind be a bit off-putting and ornery :) But worth the trouble. Nothwithstanding, the advice offered on refinishing in this post applies to KR as well. Thank you for the KR Dial information. I'm looking into them right now. Thanks for sharing with us. Once again thank you for your research and dedication to the Connie. Do you have a view on why we see redials that donot replace the raised star? I have seen a number over the years where the star is printed. Hi Ward, and thanks for your kind comments. Most of the calibre 711 and 712 Constellation dress watches of the late 60s to mid 70s do not have the applied star and I think you may be referring to those. Ive seen one or two ring-dials on other Connies that have a printed star but normally with most redials I see the applied star is there. Firstly let me complement you on an amazing Omega site just gets better and better. I wondered if you could give me a bit of advice on restoring a pie pan or could point me in the right direction. I recently bought a beautiful pie pan Constellation which I could only afford because the dial had some marks and needed some attention. I found an excellent dial restorer and asked his advice. He gave me a price but said if the indices were onyx inlaid (as many are) the restorer may not accept to do the job as they could be fitted by means of clips which, he said were so fragile that they break easily. If he did accept it, it would three times the price of normal riveted batons. My question is if there is any way I can tell if it is this type of marker without removing the dial. Also could point me towards any specific reference to removing a Constellation dial. Hmm, the refinisher seems to be fairly jittery over what is not usually a problem if approached with care. The onyx insert markers are not clipped but riveted into the dial and pressure is applied to the rivets on the back of the dial so as to push them back to dial-side. Most refinishers then re-apply the rivets with glue and dont painstakingly tap the apertures around the rivet holes to refit the rivets without glue. My instinct would be to advise you to get a second opinion Steve. The chap I spoke to at the restorers actually said it cost a lot more (if indeed he chose to accept the challenge) because it takes a week to replace the batons in these “clips”. I’ll certainly get a second opinion as you suggest. I purchased the watch from eBay after carefully reading your site articles on the scams that are so common on eBay but I’m pretty sure my pie pan has been unmolested and all is as it should be. Just as an aside, it seems the biggest rip off at the moment are sellers claiming the watch to be a pie pan when it obviously isn't. I’m not referring to the sellers who actually try to replicate a pie pan with paint but the ones which are just normal flat dials. 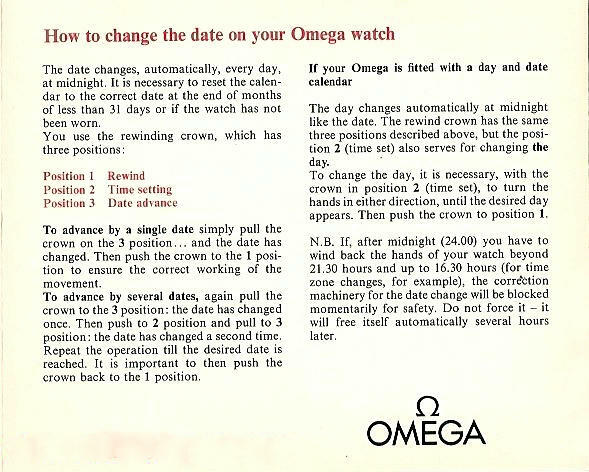 There is one particular seller who only sells Omegas and was selling an “Omega Constellation pie pan” – which obviously wasn’t. I emailed this “specialist” and said the obvious. He replied and I quote “I didn’t say the dial was pie pan – I was referring to the case”. At that point I just gave up. If you get a reply like that from someone who claims all his watches are ‘serviced by a retired Omega employee’, what chance have you got? It’s only through informative sites like yours that the average collector has a chance to get what he pays for and it’s a real shame that no one seems to be able to regulate the liars. Many thanks once again and for the link to the dial removal...an absolute mine of information. Thank you for another relevant and informative article! I would like to know if you or any other members have had experience having their watches refinished by Fargo Vintage Watches, www.farfo.com in New Jersey? I haven't heard an adverse comments Robb. Another option is to project manage the dial restoration yourself in cahoots with a local watchmaker who knows his way around old Omegas. Kirk Rich Dial Corp has a reasonable rep as a dial refinisher. But my advice above about finding good reference pics and specifying exactly what the dial should look like applies with any refinisher. Also, be prepared to reject the dial if you believe the standard of refinishing is not up to scratch.